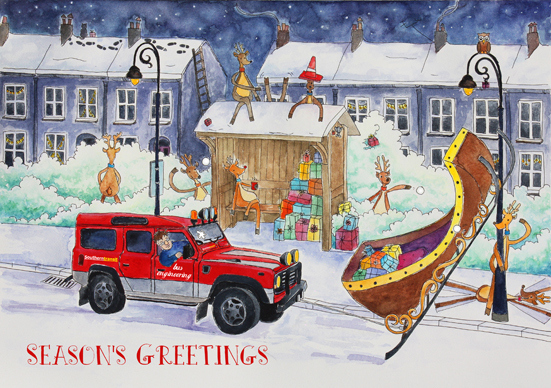 A Corporate Christmas Card commission. A fun commission of which I have done several. A Corporate Christmas card can tell your companies story, it can be humorous, simple or beautiful and most importantly it can include your logo and wording of choice both inside and outside. Please note Christmas commissions need to be placed before September to guarantee timely completion. You can find out more about commissions under the commission tab in the main menu bar at the top of the page, alternatively you can enquire about a commission via my contact page.